We have exciting news! 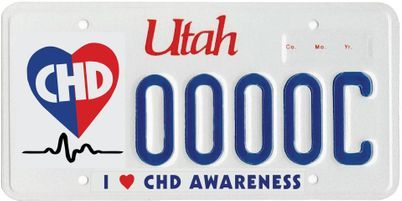 After much hard work, the Utah legislature passed a bill this year allowing for the nation’s first ever CHD specialty license plate. These license plates are now available to pre-order! The name of the specialty license plate is Children’s Heart Disease - so it covers awareness for those with congenital heart defects and childhood onset heart disease. Before the license plates can be manufactured, IHH needs 500 vehicles pre-paid for the plates. The cost for the plates is a one time $45 fee (because of a gracious donor this $45 fee has already been paid for the rest of the plates needed to get us to the 500 before plates can be printed) and an annual fee of $25/year. Intermountain Healing Hearts is the sponsoring organization for these license plates (meaning that we are covering the costs for manufacturing the plates) and IHH will also receive the yearly $25 annual fee proceeds from the license plates generate. This plate may also be personalized with up to 5 alphanumeric characters by additionally submitting Form TC-817 with the required personalization fee of $50.00. Anyone with a vehicle registered in Utah (car, trailer, rv etc) can order this license plate. So please spread the word to your family and friends. Please fill out the license plate application (FOUND HERE) and return it to chdplate@ihhearts.org. Do not delay, the sooner we get the 500 applications in, the quicker we can start printing the plates! For questions please email chdplate@ihhearts.org. What an exciting way to display CHD Awareness! IHH would like to thank Mark Weissinger and Andee Sanders who helped make this project possible. What vehicles can I register for a CHD license plate? Any vehicle registered in Utah (car, trailer, rv etc) can order this license plate. Motorcycle plates are not available. How much does it cost? The cost for the plates is a one time $45 fee (due to a generous donor this fee is being waived) and an annual fee of $25/year. The initial $45 fee includes the plate fee, registration decals, postage, and the initial yearly contribution. Intermountain Healing Hearts is the sponsoring organization for these license plates (meaning that we are covering the costs for manufacturing the plates) and IHH will also receive the yearly proceeds that the license plates generate. Can I wait until the registration is due on my vehicle? No. Until the plates are printed they are not available at time of registration. We need everyone who is interested to fill out the forms and pay now so we can hit our goal. Once we have enough, we can have the plates printed and distributed. Do it now! The cost and fees will remain the same whether you apply now or once they are printed. But if you wait, it will take longer to reach our goal to start the initial printing. Can I get a personalized CHD awareness license plate? This plate may also be personalized with up to 5 alphanumeric characters by additionally submitting Form TC-817 with the required personalization fee of $50.00. Where does the money go? The cost for the plates is a one time $45 fee (due to a generous donor this fee is being waived) and an annual fee of $25/year. The initial $45 fee includes the plate fee, registration decals, postage, and the initial yearly contribution. Intermountain Healing Hearts is the sponsoring organization for these license plates (meaning that we are covering the costs for manufacturing the plates) and IHH will also receive the yearly proceeds ($25/year each plate) that the license plates generate. Why is my check cashed now if I cannot get my plate immediately? The DMV requires that we have completed applications and payments for a minimum of 500 vehicles before the license plates can be printed. When will I get my CHD plate? The DMV requires that we have completed applications and payments for a minimum of 500 vehicles before the license plates can be printed. Why should I encourage family, friends and neighbors to register for a CHD license plate? To support your family and to spread CHD awareness. They will get asked about their unique plate and have many opportunities to share their connection. They also get to be one of the FIRST in the nation to have this option for their vehicle. Plus, they look great! Can I change the colors on my license plate? No, the plate colors and designs are preset and cannot be altered. The only exception is a vanity plate that you can choose to personalize with up to 5 alphanumeric characters.